Troop 474 Scoutmaster recounts his climb time on Mount Rainier. If your troop harbors a bunch of avid hikers-turned-mountaineers, summiting Mount Rainier could represent a lifetime achievement. But how about 30 consecutive years spent leading Scouts to the summit of Rainier? The challenging glacial traverse to the 14,410-foot summit separates weekend warriors from those adept in technical climbing, avalanche safety, self-rescue, and other specialized skills. Which makes the three decades of annual treks led by Kent Brooten, an Eagle Scout and Scoutmaster of Troop 474 of Kent, Wash., even more worthy of celebrating. 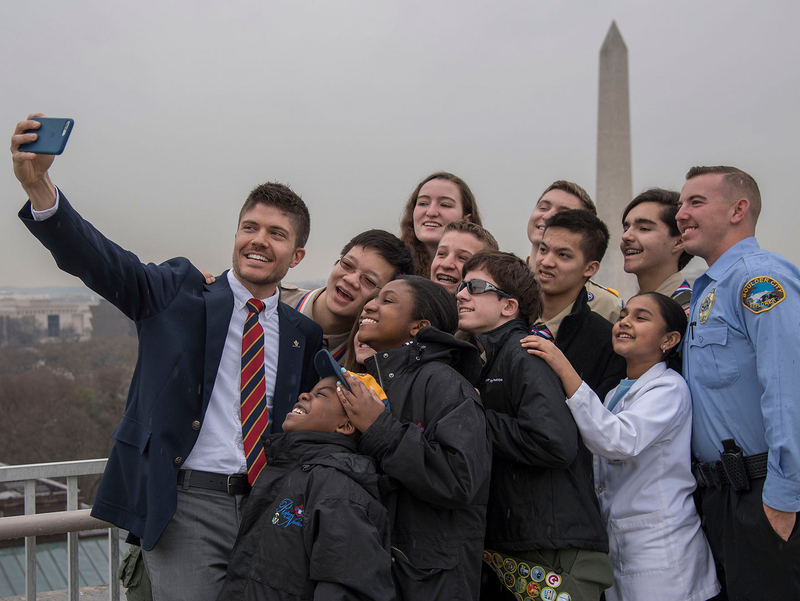 What began as a way to keep boys interested in Scouting culminated on June 26, when Brooten’s most recent team of climbers stood on the summit of the highest mountain in Washington, southeast of Seattle. His climbers included adult leader John Hogg and Troop 474 Scouts Daniel Rothschilds, 15, and Ryan Kolbrick, 15. Ryan’s 24-year-old brother Reece, an Eagle Scout who made the 25th-anniversary climb in 2006 (see Scouting magazine article), also made the ascent. At 3 a.m., June 26, I think, “What am I doing here? This has got to be my last year.” These thoughts run through my mind, year after year, typically at a time when my deepest sleep would occur. John and Reece relax at base camp—elevation 8,500 feet—before climbing to Mt. Rainier's summit the next morning. Yesterday, I woke at 12:15 a.m. We reached basecamp at 8,500 feet the night before, dug level platforms, set up tents, melted snow to refill poly bottles, and boiled water for dinner. We were in our bags by 6:15 p.m.
Now, six hours later, we woke in the cold, still night, anxious to climb—our destination 6,000 vertical feet above us. With headlamps lighting the way, the five of us climbed toward the Kautz Icefall, a rock outcrop with a glacier atop. Skirting an ice chute, we descended several hundred feet to avoid some jagged house-height ice blocks. Now, with a clear path to the summit, we slowly climbed. By 6 a.m., I was back to my normal, optimistic self, gauging our hourly progress, the energy level of the team, and snow conditions. This route was wanded [a trail marked with small bamboo sticks with flags at the end—a climber’s version of breadcrumbs], so it was a little less challenging than other years when I had more navigation responsibilities. But, with glaciers constantly changing, it wasn’t robotic. At each hourly break, I reminded everyone to re-apply sunscreen, particularly inside their nostrils and inside their ears, to protect against reflections. Finally, about a half-day after leaving, we crested the summit rim, taking a break for snacks and water. I laid on my sit pad and pack. Fifty-five minutes later I woke to find all five of us were napping—it was an early wakeup, after all. Troop 474 climbers approach the summit along a wanded trail. “Let’s go get our summit photo,” I suggested. We were on the crater rim; the actual high point was a quarter-mile away. The summit was windy, as it almost always is. It meant a lot to see Reece and his brother Ryan standing next to each other on the summit. Their father died when they were young, just like mine, and I felt a deep connection to them. My Scoutmaster had played a significant role in my life, and I hope that I’ve done the same. Daniel was seeing his second summit. John, a Scout leader and friend from Kansas, was happy. He is bagging the 50 high points in each of the 50 states in memory of his son who passed away. This was his 47th state. It was a good climb. I celebrated my 40th successful Rainier summit. Back on our way—the sun beating down—staying hydrated was key as we descended to base camp. Just after crossing the ice chute, with only one small 12-foot rock section left to scale, disaster struck. I had been warning the boys to be extremely careful with their personal items—they could easily lose a water bottle or their whole summit pack if it wasn’t constantly secured, particularly during breaks. I had my camera case clipped into my chest loop and needed to move it to my pack to get through the tight rock gap, yet I sat it down and stood in front of it to prevent sliding. That was no deterrent. The little rascal scooted around my feet and headed for a joy ride. Reaching terminal velocity in 3.4 seconds, it leapt off the ice, bouncing off rocks, crying, “Catch me if you can!” Three-hundred vertical feet later it came to rest. The group on the summit: John, Daniel, Reece, Ryan, and Kent (from left). Their success marks 30 years of summits for Troop 474. On my way to retrieve it, I considered the contents. $1,200 camera body, $500 lens, filters, polarizer, $450 GPS, $150 altimeter. (Sigh. I know, how could I be so stupid?) I recovered almost all of it. Lens smashed, GPS smashed, hard to tell about the camera body—oh good! One survivor: a pair of $7 reading glasses from Costco! Oh well. Finally back to basecamp, we packed up the tent and gear and continued down. Still on a glacier, we needed to remain roped. We had now marked 20 hours of almost continuous climbing. Crossing the Nisqually Glacier, we kick-stepped up a final 150-foot steep moraine, and then we un-roped. Darkness fell at 10 p.m., and we hiked through the snow, arriving back at the Paradise parking lot by 11:15. We were tired but happy. As we drove back to civilization, I realized neither I nor the other adult with a phone had made contact from the summit. Finally, at 1 a.m., cell service was available. The boys and husbands were able to reach their (worried) families to confirm our safe return. The boys officially left my care at 3 a.m. Monday morning when their parents picked them up. Now, I write this story a week later while on our “Tyke Hike”, a five-day backpacking trip with the new Scouts who just crossed over from Cub Scouts in February. Two of the dads said they want to climb with their sons three or four years from now. While Brooten and his Scouts made this kind of climbing look easy, preparations began six months before the trip. In January, the boys started running, gradually increasing their distance to about 40 miles per week. They also began doing preliminary climbs to get in better shape and practice self-arrest moves with their ice axes. But the boys did more than just run. They also speed-hiked up a nearby hill—with a 35-pound pack strapped to their backs. At weekly meetings, they practiced basic rope skills, including coiling and uncoiling, tying-in, and handling. Ryan Kolbrick practices using a prussic rope, a type of self-rescue training required for glacial mountaineering. Brooten also scheduled mandatory meetings in his backyard pole barn, where the boys practiced using prussic ropes to extract themselves from a potential crevasse fall. Sure, this all sounds highly skilled and out of reach for most—especially flatlanders. But Brooten says that determination and training go a long way. Still, he also stresses that unit leaders must pass the BSA’s requirements to lead climbs (read more on requirements here). This isn’t your average Colorado 14er; this is “extended glacier travel,” Brooten says, which dramatically amplifies the danger, especially in weather conditions that can change quickly. Brooten does recommend climbing courses, including the programs at The Mountaineers (in Seattle) and Mazama (in Portland, Ore.), as well as reputable guide services—costing about $1,000 per climber—including Rainier Mountaineering, Inc. Expeditions (RMI) and Alpine Ascents International. Camp Sheppard, in the Chief Seattle Council, hosts a training program during the summer. But this program is on hold. However, council camping director Doug Mitschke says they plan to reestablish the program in 2012. We’ll keep you updated. Kent Brooten has been SM of Troop 474 since January of 1977. He has led nearly 70 long-term outings, including hikes in the Yukon in Northern Canada, biking in Hawaii, sailing in the Bahamas, canoeing in Ontario, and winter cross-country ski trips around Crater Lake in Oregon. Troop 474 consists of about 80 boys who have the opportunity to camp between 50 to 60 nights per year.